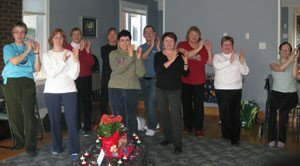 Winter 8-week classes beginning at The Lantern, 35 Barnes Road, St. John’s, April 2nd until May 23rd. Saturday Retreat Days tentatively planned for April 27th at Virginia Water Retreat House on Virginia Lake, 47 Parsonage Drive, off Logy Bay Road . See NEWS page for updates. 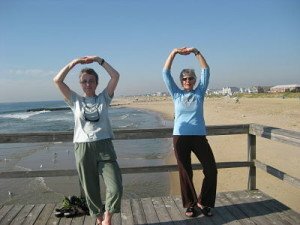 T’ai Chi Chih ® Joy thru Movement is a series of 20 gentle, easy to learn movements designed to help stimulate, circulate and balance the flow of Chi, that natural, vital, universal Energy in our bodies, the same Energy that is in everything that exists. Softness and continuity are the essence of T’ai Chi Chih. It is the soft water that wears away the hard rock, the tongue outlasts the teeth. Hardness and confrontation are brittle and destructive, softness and a gentle manner of thinking are life-enriching. The more balanced, the more freely the Chi flows in our body, the greater wellness and vitality we experience. It is indeed yet another way to help yourself feel better, in body mind and spirit,using your own natural inner resources. No special clothing or equipment is required and very little space is needed, making T’ai Chi Chih very portable, a virtual moveable feast! All of the moves can be comfortably learned in a series of eight sessions of an hour and a half. I have also taught the full set on an 8-hour weekend. The weekend is obviously more intense but it works well for students who are unable to commit to the full 8 weeks. Look at the contrast between the oak tree and the bamboo. When a storm comes, the sturdy oak stands solid against the wind until it is overcome and breaks and dies. The bamboo, however, bends with the wind, and when the storm has passed, snaps back into place, unharmed. Softness proves more durable than hardness. Assertiveness takes a back seat to gentle firmness. T’ai Chi Chih becomes a way of life. It is true that the gentle movements of T’ai Chi Chih form a moving meditation and an exercise of great efficiency – exercising the inner organs and promoting healing – but eventually it goes beyond these and permeates the life-style of the practitioner. With the gentle movements of T’ai Chi Chih, even if we do only a few of them repetitively, comes a quieting of the emotions as the Chi (Vital Force) circulates and is then balanced. When the Yin and the Yang Chi are brought into balance, we are in a relaxed and meditative state. Since this is cumulative, the practice of T’ai Chi Chih in the morning upon rising, or in the afternoon before dinner, or both, can become a very pleasant habit that builds up the Vital Force stored in the bones and below the navel. With this accumulation we begin to notice the rapid growth of intuition, of creativity, and energy, and a strength far different from muscular strength … we find a growth of confidence, a belief in ourselves and our centre of being. The moves are generally done in repetitions of 3 for most of the sideways moves or 9 for those that go forward and backward plus for 2 of the sideways moves. They are essentially done with the waist and wrists while the rest of the body flows with the movement and adjusts accordingly, the spine remaining straight the whole time and the gaze soft and forward. While the moves are most often done standing, there is also a seated form, designed for those with physical challenges, including students in wheelchairs. 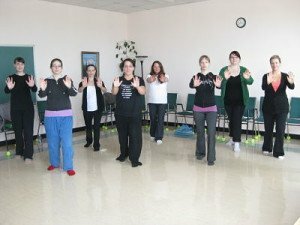 T’ai Chi Chih is not a Martial Art form, but rather “a moving meditation” whose essence is softness, promoting serenity and a greater sense of well-being. Who Can Do T’ai Chi Chih? The simple, gentle movements can be easily learned by people of all ages … the very young as well as the very old, and everyone in between. My students have actually ranged from 9 to 104 over the years! Classes can be done seated or standing, or a mix of the two. For those with physical limitations, the movements may be done with some modification.Some students who are in wheelchairs have come and enJOYed my classes and have have done quite well, experiencing a lot of benefits. T’ai Chi Chih does not require a particular level of physical fitness, balance or coordination. In fact, students report remarkable improvements in both balance and co-ordination and overall well-being. Browse the official world-wide T’ai Ci Chih web site for more information. soft moves of T’ai Chi Chih. It omits Light at the Top of the Head and Light at the Temple and uses a slight variation in form for Bird Flaps its Wings, Carry the Ball to the Side, and Cosmic Consciousness Pose. Seijaku also includes some preliminaries before Rocking Motion, as well as what is referred to as the Jing, plus 3 meditations, and The Joy Song which Justin himself wrote.